It is unfortunate, but I have to postpone going to see Rob Messenger’s magnificent exhibition in Canberra. I mentioned last week that I was taking leave at a point that it wasn’t the most financially optimal time for me to do so, and at the end of last week a couple of things made it a bit difficult – if not impractical to launch into a drive down to Canberra. And yes. It will involve a typewriter. 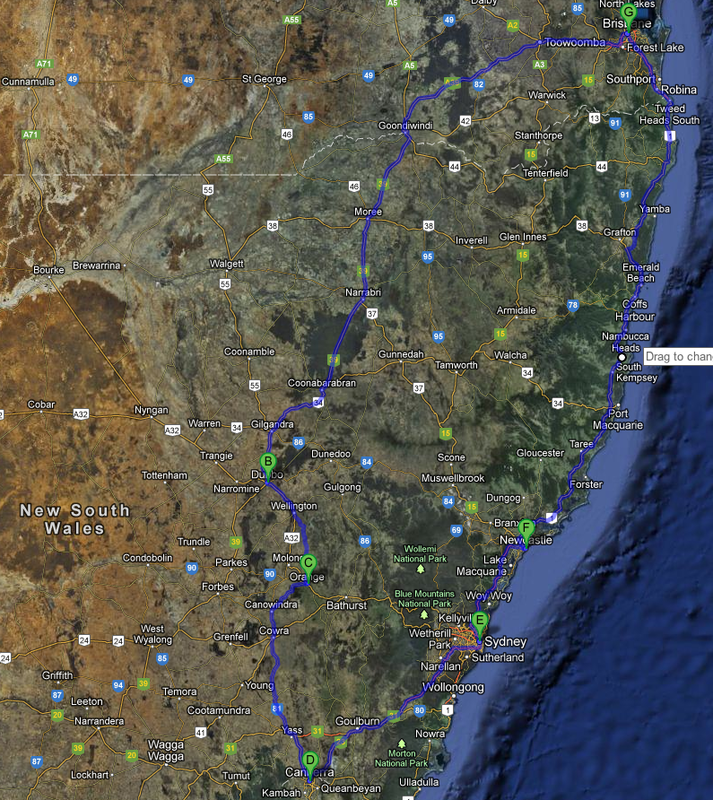 Brisbane – Canberra ’round’ trip: 2600 KM. (1616 miles) Visiting Rob’s exhibit. Click to view in more detail. I’d planned to stay a night in Dubbo or Orange, a night in Canberra, and probably a night on the way back in Newcastle. I had not organise accommodation previously, and despite knowing people in Dubbo, Orange and Newcastle, I had no certainty about getting accommodation cheaply or even freely. Having my car serviced unfortunately ended up costing more than originally quoted, and this put a bit of a strain on my budget. After I collected my car – the afternoon after I finished writing the ‘Valentine’ blog post, I ended up getting struck down by a severe Migraine that left me writhing about in bed for most of Friday, feeling like I was being repeatedly struck in the back of my head with a shovel. I knew something was wrong when I couldn’t shift that headache I had been suffering for a few days prior, and dealing with the Valentine project seemed to be oddly beyond my usual abilities. I’d had a hugely stressful week the week before, and I guess something just had to give way when I took leave. It really just highlighted to me just how much of a strain I had been under. Two days after my Migraine, and I’m feeling relaxed, and a lot more optimistic. But the strain reminded me that I needed to take things a bit easier at the moment. I love driving, but pushing it hard through New South Wales along the Great Dividing Range didn’t strike me as being the best thing to do. However I decided I still needed a bit of a trip away from Brisbane. I was my first voluntarily taken paid holiday since I’ve been working at the Hospital, after all. 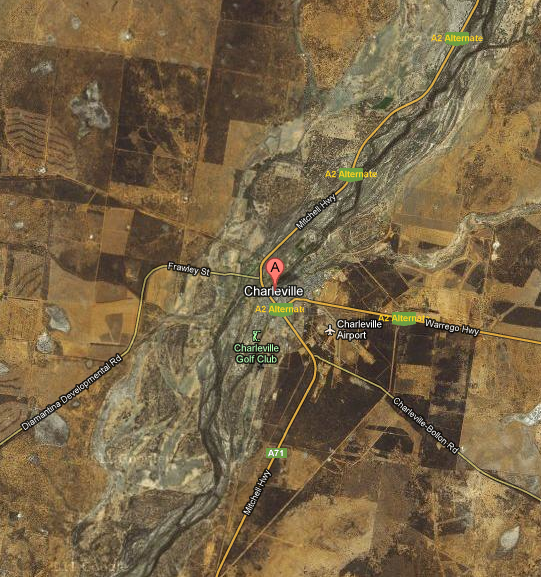 Charleville is approximately 770 km (478 miles) out of Brisbane. It sits far over the other side of the ‘Great Dividing Range’, and essentially is on the doorstep of one of the most rugged parts of the Outback. Yeah! It even has a golf club. If only I could play. Charleville is at the edge of a region that is known as ‘The Channel Country’ – an area that despite being largely desert, occasionally floods to form a series of vibrant rivers which will feed into Lake Eyre. I’ve lived in Brisbane for 7 years now, and as yet I haven’t gotten any further into exploring Queensland than a town west of Brisbane called Toowoomba, while going no further north that Hervey Bay. That is to say, I haven’t explored outside relative safety of the South East Queensland region. So what’s at Charleville? Well, nothing in the traditional sense. Queensland is largely seen in Australia as being something of a Tourism hub. Most of this is concentrated along the eastern coast where the beautiful beaches, tropical island resorts, amazing rain forests and the Great Barrier Reef holds the interest of tourists. I could point my car north and follow the endless lines of beautiful beaches where I could take thousands of amazing sunrise photos that my friends could use to make Facebook memes of about love and positive thinking. But that just doesn’t interest me. I’ve seen enough beach. Heck, I’ve driven on them, camped on them, swam off them, walked on them and photographed the hell out of them. I don’t want to stare at the beauty of palm trees and sand surrounded by tourists dressed in their most tropical attire. I want to explore, in the way I have always explored. I also know people located at Charleville and Roma hospitals, that I talk to on the phone on a professional basis occasionally. So I’m loading up Ruby the Exxy (my car) and hitting the road to see what is out there. What life is like elsewhere. The reason I want to go out this way, is because of a town named Cunnamulla – a town about 200km south of Charleville. In the year 2000 a documentary about Cunnamulla was released. It wasn’t about the town per-se, but rather a collective tales about the darker sides of some of the people living there. It is a hard film to watch because of the content and the brutal honesty, but it is worth it because it can give you a picture of what being brought up in some of Australia’s most isolated areas can be like. But these harrowing personal tales tell nothing about the town and the life out in this region. I want to go and see the land for myself. Living in Brisbane gives you a skewed view of what country life is like, as much of the city’s culture tends to be about being a ‘big country town’. it celebrates this with festivals like the oxymoronic ‘Urban Country Festival’, and the recently defunct ‘River festival’. But Brisbane is more of a sprawling suburban metropolis that is filled with would-be cowboys in Hilux utes and land cruisers, that country it up on Fraser island ever so often. Meanwhile the same cowboys ‘Fly in – fly out’ of rural areas, as we rush to dig up the landscape in what we call ‘the mining boom’. They care little for the farmers, the towns folk and the indigenous Australians that actually live there. I’ve done trips like this before. In the past I spent a large amount of time in Whyalla, South Australia where I worked in a Mobile Disco that travelled to many mining and industrial towns in the region. I got to see some of the best, and worst of what life was like in the desert of South Australia. So I’m off for a handful of days, to get my first taste of the region. My mobile provider only provides coverage as far as the town of Roma, so I’ll be very much on my own. I’ll be loading up my camera, clothes, UHF and….. my typewriter. So….. Which typewriter to take? The prerogative is that it needs to be portable. Ideally the more robust the better. But I also want it to be nice to type with, as I’ll be bashing out a few pages, letters and ideally a handful of typecasts. Mr Messenger – I may not make your exhibition this week, but it doesn’t stop me getting my type-on out there in the outback. 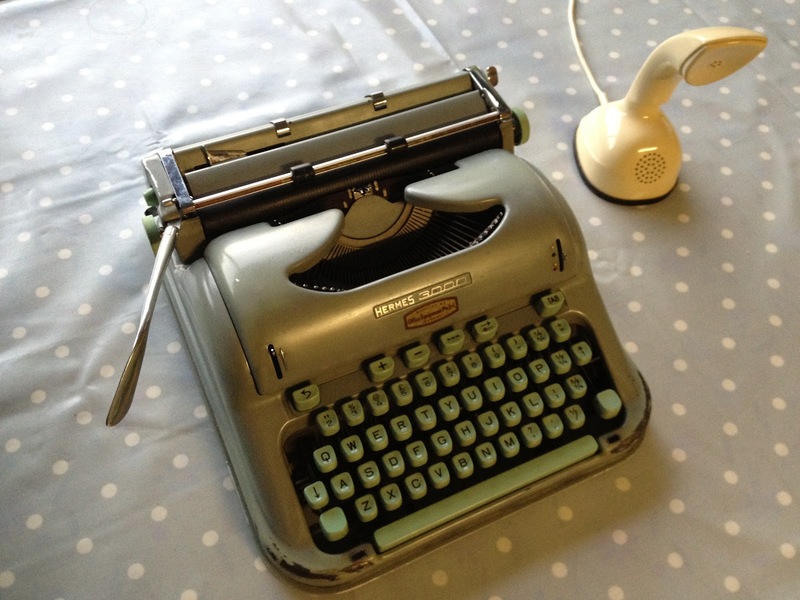 Australian typing – or the Australian typewriter museum. I have quite a collection of typers, but these are the candidates on this occasion. I have typecast on almost all of these on here before. My Royal portable. Arrow or QDL? Who knows… it has no name. But Ernest Hemingway once hammered on the glass keys of a near identical model. Perhaps this is the machine for telling a journey of adventure – or to tell the tale from the point of view of an action ready Journalist. Good to type on this machine robust enough to have actually survived being drowned in a flood. 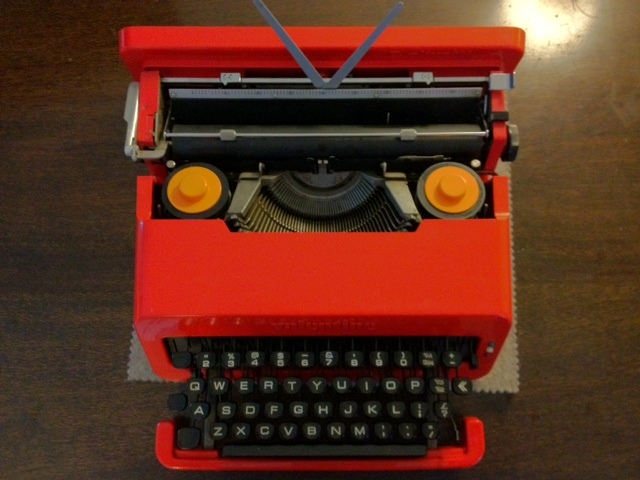 Smith-Corona Sterling – T.S. Eliot used one of these to explore the mental landscapes of men and women from many different places. He has explored the diversity of cultural clash, and the dreams of failed dreamers. But he often found beauty in the most intimate of places. This machine is solid and stylish, and a very capable typer. The Valentine. No respectable writer has ever claimed to bash out a tale on one of these. But the hard case looks at home amongst camping gear hard cases. Not to mention this machine owes me serious quality time after I brought it back to life. Robust? No. Good to type with? Meh. But it does it with style. Hemes 3000. Jack Kerouac, Stephen Fry. Both these men are immeasurably intelligent, and are immeasurable in their diversity. Kerouac explored the freedom that living gave you, and its consequences, while Fry is compassionate and inquisitive. This machine is very robust, and beautiful to type with. Adler Tippa – Script. Jill Kernaghan (my mother) spent many hours at the keyboard of her Adler. She never could justify buying a cursive model, but she loved them. 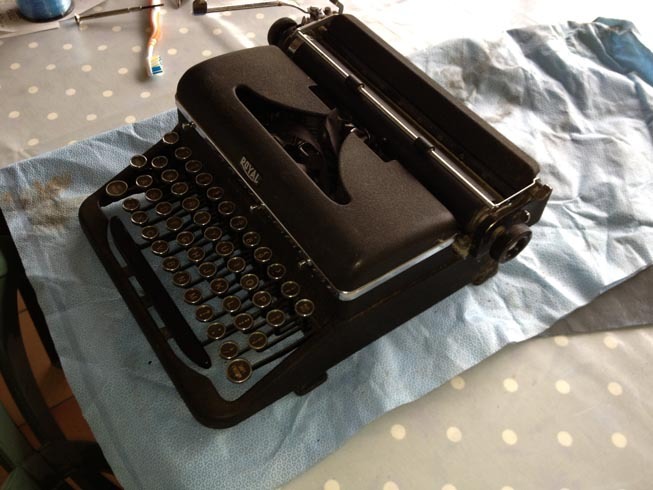 While this isn’t my mother’s typewriter, I have kept this on has my memory of her. Quite robust and reasonably nice to write with. this machine looks almost new, bar the scars on the case where it had been the writing tool for a man that was painter and a musician. John Steinbeck. The landscape played second fiddle to the drama and the passion in his writing. But there was a love of the land, and an appreciation of the struggle of the people living on it. Harsh to type with, its size makes it amazingly portable. A competent writer, that is nearly 60 years old but is well made enough that it doesn’t show any of those years. Remington Quiet Riter. Hermann Hesse. Hermann was a passionate artist who was also a highly analytical thinker. He was a courageous man who questioned the dogma of the time, and often rushed in to put his life at great personal risk to do what he felt needed to be done – or said. This machine is a word tractor, and is built like a tank. 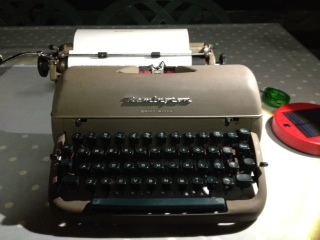 It is a reliable writer, even if it can sometimes feel a bit too mechanical to write with. So, el typosphere – what should I take on my little adventure? July 15, 2012 in Charleville, drive, Exhibition, explore, folly, journey, road, trip. Photos and thoughts…. n’ stuff. ← A hate letter to my Valentine. I reckon the Rem Quiet. It's solid like a battleship, dust-proof, runs on diesel. It's heavy to slug around, but it's got the goods. It's the machine to take if you're going All the Way Up the River, or Way Out Back, methinks. For portability, obviously the Hermes Baby. For delicious typing, the Smith Corona Standard. For durability, the Remington Quiet-Riter. Really, what do you think you'll need it for most? If I were sitting in front of these typers, and had to choose one, I think I would ultimately choose the SC Standard. It sounds like the best choice all around. Good luck and safe travels! You Typospherians and all your locations make me aware how tiny Switzerland is – we've had Type-Ins in basically every corner of the country, Geneva, Basel, Lugano and it was only a matter of 2 or 3 hours by train. Last year, I did a summer series in the swiss mountains, the Hermes Baby proved to be a reliable companion. I know that I'm going to take a Groma Kolibri with me when I'll be visiting the former GDR later this summer. I vote for the Hermes Baby: highly portable & good typing. I have to say I always feel a thrill of fear when I consider the immensity of the desert outback (which I've only been able to do from a very considerable safe distance). 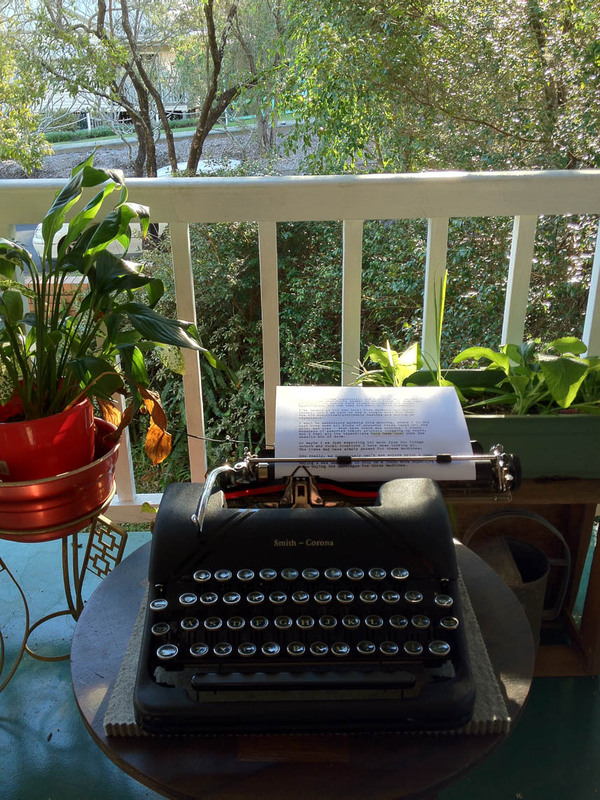 Your adventure sounds exciting, and chronicling it with a typewriter is an excellent idea. We will look forward to your reports. Take the Valentine and settle the score! Take whichever you like the least, so that when you drop it, scratch it, dent it, or lose it, you won't regret taking it on the road. I like your thinking…. Very sound logic. I like the idea of taking the SC, because it is quite a cool and stylish machine. Fair comments. Ha ha ha…. Oh, To give you an idea of the size of Queensland, you can fit Texas into it twice, and still have enough land to fit in maybe a couple of smaller American states. Putting this in perspective, the state of Queensland could fit Switzerland inside its borders 45 times. So, Hermes baby is your vote? Excellent choice sir! I agree… On both counts, it is reliable and fairly good to type with. It is probably not quite as good as the others on this list, but more than adequate. So, that's 2 for the Baby.. The baby is in the lead. Have fun in the Outback! Sounds like a true epic journey. I would possibly never drive out like that myself, so you're very brave. Very. Watch out of roo's! Well in view of roo's… I'd say take the Hermes Baby. It's light and easy to grab and run if ever one of them critters come hopping mad after ye'. Richard, Never watch a film called 'Wolf Creek'. You will never want to go near the outback… ever. Even though the film is just teen horror fodder. That's 2 for the Quiet-riter, and I think it is a very sound suggestion too. 'The Tank' is at 2, V's Kermit (the baby) at 2…. And yes, you're right about the Valentine. It's a big desert to pop a bearing and try and find it in. I'm going to put you down for the Quiet-riter. I love it, but it's the toughest by far. This is a machine that can take a hell of a lot of abuse. The rest just aren't so robust. It's not as epic as I would have liked, but it should be interesting. And, oh yes… the Roos… They are going to be a read danger heading out this way. I'll need to do most of my travelling in the hottest part of the day to try and catch them when they are typically just chillin' out in the shade. Good advice about Wolf Creek – disregard at your peril!